Winter walks are the perfect way to escape the madness of Christmas shopping and spend some quality time with friends and family in the great outdoors. If you are stuck for a Christmas present for an outdoor enthusiast, why not give them a ViewRanger Gift Voucher, to download some Ordnance Survey mapping, or routes to their phone. Find out more here. This month’s National Trust walk of the month is a great Christmas walk in Mottisfont. The walk starts off at the beautiful Mottisfont Abbey. A country home built around a medieval priory, with spectacular autumn leaves and a colourful winter garden. The home is now a National Trust property, open to visitors and the gallery will be hosting a ‘Talons and Tiaras’ exhibition over the New Year.The exhibition includes designer gowns inspired by birds, as well as stunning trees covered in winter decorations. To keep the children entertained there is also a Swan Queen secret trail around the grounds and an opportunity to try on sparkly dresses and handsome cloaks in the Boudoir, or make your own crown! The grounds of the abbey are a mix of formal lawns and gardens. The bright red stems of the Dogwood-Cornus plant mixes with the smell of winter Honeysuckle to create a delightful Christmas experience. 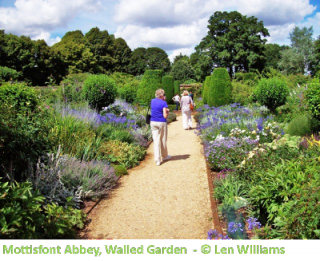 If you visit the abbey we recommend you try WalkingWorld’s walk in the surrounding area. You can download the route to your smartphone via the ViewRanger app which will also show you where you are on the route so you don’t get lost. Click here for more information. On WalkingWorld’s walk you should make sure to visit St Andrew’s Church. Built in the 12th century, this grade-1 listed church houses a rare 400 year-old clock mechanism. The only other working example of this is in Salisbury Cathedral, so it’s worth checking out. The walk follows the north side of the River Dun. 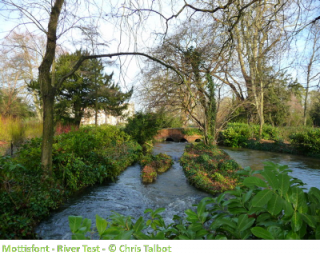 This fast-flowing river was once planned to become a canal link from Southampton to Salisbury, but the plans were never completed and you can enjoy the river in its natural state today. The banks of the river are kept in pristine condition for trout fishing. Fishermen flock to the river in summer and autumn, when the trout are plentiful. Turning right before the river crossing, the walk then joins the Mottisfont estate path which will bring you back to the Abbey. Before you leave, make sure to check out the Ice House behind the stables. Traditionally used to store ice from the winter for use in the summer months, Mottisfont’s is one of the few remaining ice houses in such good condition. Have you taken some nice photos on any walks recently? If you do go on a winter walk please remember to show us your pictures on Facebook (ViewRanger GPS) or twitter (@viewranger). We love hearing from you! And remember, the ViewRanger Gift Voucher if you need a last minute Christmas present this year!